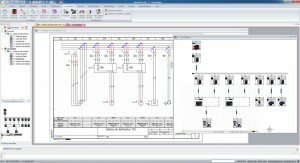 Conceive your electrical studies with elec calc™ by respecting the standard and capitalize on your work by generating the folios of multi-line cabling and the general synoptic in automatic in elecworks. Enjoy with elecworks of a real electrical CAD. Conceive your electrical studies with elec calc ™ by respecting the norm and accumulate your work by generating the folios of multi-line cabling and the general synoptic in Solidworks Electrical. Complete then your project with the command control part and the panel layout or the 2D and 3D layout.